When Hubby and I went antiquing and bought my trunk that I showed you earlier, we also bought this. It is heavy metal and not fragile at all. In essence it’s just a basket on legs. But what was it intended for?? The guy that I bought it from said the person that he bought it from said that it was used for picking eggs. All of the eggs were put into this basket as they were collected. Well that didn’t make a lot of sense to me as the basket at the top is only as big as about two large wire egg baskets. We told a friend about it and he said it was for light bulbs to be sold in stores before they had packaging around the light bulbs. I guess I could believe that. I’d love to know what it’s original purpose was. Do any of you have a guess?? I have several potential uses for it in the new house-a hamper in the laundry room-in the bathroom to hold towels-in the sewing room to display small folded quilts or precuts or any number of things. I just knew I loved it and wanted it. It is in great shape…I’d just like to know more about it. Today I am hooking up with Colorado Lady’s Vintage Thingy Thursday. Today I am thankful for the blessing of being my own boss and being able to work from home. There is some bad to this as in I wake up and am at work but it’s mostly all good. I was able to juggle work and still stay home with our kids. I am able to easily help Hubby when needed, go to town and do errands or appointments during the day. I can work at night and sew during the day. I can stop everything and work on charity quilts for a week. I love the freedom. I love that I am still able to make some money too. Honestly, I have the best job ever!! This entry was posted in Thrift Finds, Vintage and Antiques on November 21, 2013 by Jo. I don’t know what it is but maybe it would be a cute moss and flower planter. It seems to me that my Grandpa’s butcher shop had one of these for eggs. Thanks for the memory. It’s an egg basket. I’m a country girl from the South and have seen these many times. My Mom had one similar and used it to catch the dirty clothes. Wonder where it went when we cleaned out her house?? It possibly was an egg basket, but we never had one that large. You have a lot of option for its use now. I so want to to auctions and antiqueing with you. It’s a great basket. I have a basket exactly like it with no legs. It sounds like the consensus is for eggs! Jo, google antique egg baskets. You will find many of them that are similar to yours, although I didn’t see any on legs like yours. Pinterest has some cool pics of how to use them in decorating! It seems I’ve seen one used for laundry before. It had a fabric liner made for it that folded over the top and tied to the sides. So cool. I don’t know what it was for, but I think that what you are planning to use it for will work! If I were to hazard a guess, I’d say it was a basket for holding a very large potted plant. My guess would be an egg basket! This is really cute!! I like the idea of a towel holder. My first thought was for collecting apples off trees (along with other fruits). But, eggs make sense too. I have a one that is folds up, and the basket part is shorter. Your basket is much deeper than mine. I thought mine was made for laundry. It would hold a lot of fabric scraps. I saw one used as a lamp table. They had a round piece of glass cut to put on top. It is for holding tennis balls. It would sit next to the coach who would grab a ball and hit it across the net to the student. Today there are machines for that. It’s too big and not portable enough for eggs. My folks had a grocery store. 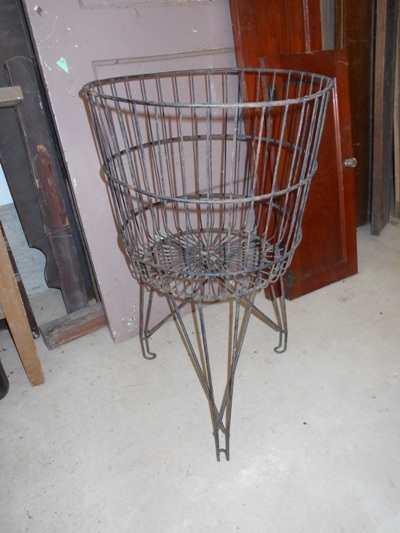 This style of basket was used for hard skinned produce, like Onions, squash or melons. 1960 -1970 era. I thought It might make a great plant holder( with another pot inside, of course). I immediately thought it was a laundry basket until you described the size. Whatever it’s intended purpose, there are so many different things you can do with it now. It would make an amazing planter!